On 24.10.2009 in the "Dunav" hall, Russe was held the national tournament for the "Bulgaria" cup in Shinkyokushin karate for children of 10 and 14 years of age. The competition was very strong and in it took part many of the Bulgarian Karate-do Kyokushin Federation's young talents from clubs of the whole country. The audience got the witness many close and dynamic matches, in which the children showed great technical growth, excellent preparation and a strong will to win. The competitors of SC "Kyokushin" - Shumen, with chairman sempai Stoian Obretenov - 1st dan, had a very strong presence at the tournament, winning 6 gold, 3 silver and 4 bronze medals as well as first place in the team standings for children of 10 years of age and third place for children of 14 years of age. This cemented the club's position as one of the clubs with the strongest team of young karatekas. 1. Dian Petkov in the 10 years of age, 30kg category, who won all of his matches with ipon. 2. Nesrin Nedjet in the 10 years of age, 28kg category. 3. Kader Rizaeva in the 10 years of age, 25kg category. 4. Serpil Galib in the 10 years of age, 31kg category, who fought marvelously, winning all her matches on the way to first place, although this was her debut in this competition. 5. Osman Osman in the 14 years of age, 57kg category, who showed great growth in the last few months and in his final match knocked his opponent out with a strong series of punches and will take part in Shumen's team for the International Romanian Open Cup. 6. Simona Stoianova in the 14 years of age, 41kg category, who fought an excellent match against Denitsa Georgieva of SC "Russe", coming very close to a vazaari or ipon. 1. Aleksandar Bachev in the 10 years of age, 39kg category. 2. Arzu Fikretova in the 10 years of age, 28kg category. 3. Iozjan Erjebov in the 14 years of age, 39kg category. 1. Roberto Vasilev in the 10 years of age, 35kg category. 2. Mark Chervenkov in the 14 years of age, 51kg category. 3. Ivelina Petrova in the 14 years of age, 54kg category, who actually is in the 12 years of age category, but accepted the challenge of playing in a higher age group and fought very strong matches with the older competitors. A good performance was made as well by Enis Pevatov, Emil Bachev, Kaan Shukri, Simeon Grigorov, Ali Aliev, Ivan Radoslavov and Taifun Mehmed, who fought well, even though they did not win medals. A large part of the prized competitors of Shumen train in the branch of the club in Tzarev Brod, under the leadership of Aidan Ahmed, to whom they owe their growth and good results. On 27.09.2009 SC "Kyokushin" - Shumen was host to a training camp, in which took part around 60 competitors from the cities: Shumen, Russe, Novi Pazar, Nesebar, Veliki Preslav and town Tzarev Brod. The event proceeded with two-part training sessions, during the first of which were played friendly matches in age groups and appropriate judges. The second part was focused on endurance training, combinations and sparing that were meant to improve the technical skills of the young karatekas. This event was a part of the preparation for the competitors of SC "Kyokushin" - Shumen for the upcoming tournaments - the Republica tournament "BULGARIA Cup" for children of 10 and 14 years of age, which will is scheduled for October in Russe, and the international tournament for juniors and cadets Romanian Open Cup, which will take place in Oradeia - Romania. From the 7th to the 12th of July, 2009 in Primorsko was held the traditional summer camp in karate Kyokushin. On this great event of the Bulgarian Karate-Do Kyokushin Federation took part karatekas from clubs of the whole country. The camp was led by sensei Kensaku Yamamoto - 4th dan/five time champion of Japan/, sensei Valeri Dimitrov - 3rd dan/seven time european champion, two time world champion and third in the absolute category in 2007/ and sensei Dimitar Popov - 3rd Dan/five time european champion/. The training sessions were held in a very friendly fashion and all the karatekas could learn from some of the biggest names in karate Shinkyokushin. 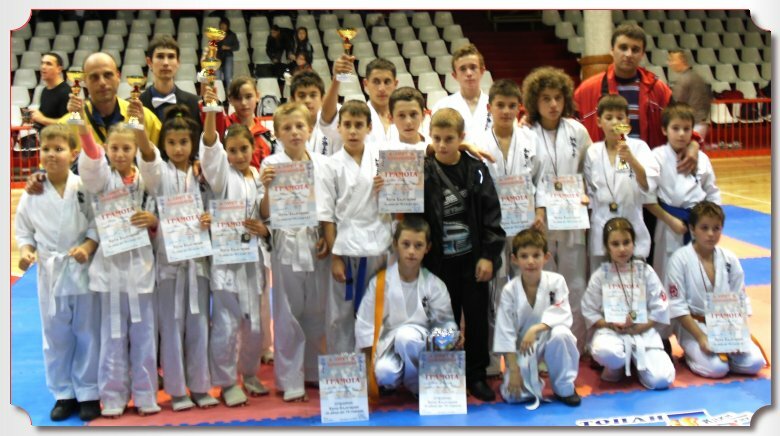 The competitors of SK "Kyokushin" - Shumen came home enriched with many new friends and accumulated impressions.